1. In a large bowl add whole wheat flour, 1 tablespoon oil and little salt. Add little water to knead a slightly firm dough for paranthas. Roughly 3 tablespoons of water should be enough for this quantity of flour. But adjust as per your preference or change in quantity. Keep aside for half an hour. 2. Meanwhile, boil peas in a wok in their pods for 10 minutes or till done. Shell the peas and dry them for few minutes. Mash them well. Add all the seasoning, coriander, ginger, green chilli along with remaining 1 tablespoon of oil. 3. Knead the dough firmly for 1-2 minutes again. Divide it into small portions, roughly 3-4. Make into small round balls, flatten. Put a portion of prepared peas mixture in the centre, fold the dough over to cover and re-shape into a ball. Now roll the ball gently and thinly. You may use flour to help roll it out. Alternatively, you can divide the dough into 6 portions and roll each ball into thin circles. Place filling on one circle and spread it out evenly to cover the circle completely. Cover this circle with another circle and press the edges of the two circles firmly to seal them off. Repeat for other 4 circles, giving you 2 more paranthas. 4. 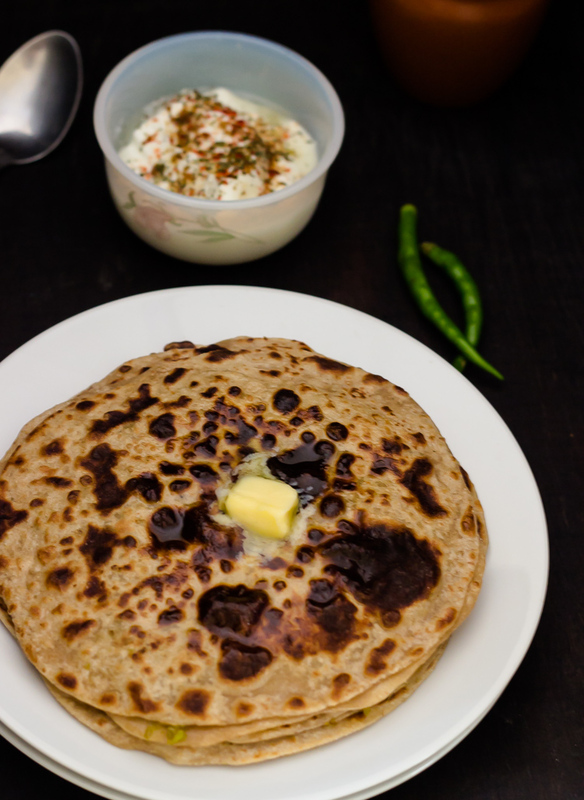 Heat a griddle, and when the tawa is hot, place one of the prepared parantha and allow it to cook from one side, when slightly puffed and done, turn it over and allow it to cook from the other side. Use some oil to nicely fry the paranthas. Serve hot with curd, chutney or pickle. You can use ghee (Clarified Butter) in place of oil to fry as well as knead dough for better taste and more calories.